Hannum Vascular Clinic & Vein Treatment Center is owned and operated by Dr. Scott Hannum, D.O., board certified, Vascular Surgeon. Dr. Scott Hannum graduated from Michigan State University College of Osteopathic Medicine in 1994. Dr. Hannum is licensed to practice medicine in the state of Florida. Dr. Hannum completed a residency in General Surgery at Garden City Hospital in Garden City, Michigan from 1995 to 1999, and Vascular Surgery fellowship at Bi-County Hospital, part of Michigan State University College of Osteopathic Medicine, from 1999-2001. 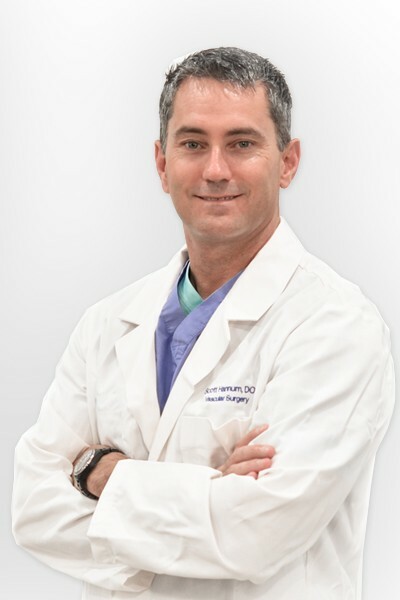 Specializing in the field of Vascular Surgery, Dr. Hannum is prepared to evaluate and provide treatment for complications and diseases of the blood vessels (arteries and veins), including traditional open surgeries and endovascular surgical techniques. These include carotid artery surgery and stenting, endovascular abdominal aortic aneurysm repair, peripheral artery angiography, angioplasty, stenting, and atherectomy. Also offered, office based minimally invasive varicose vein treatment, including laser and radiofrequency ablation of veins.